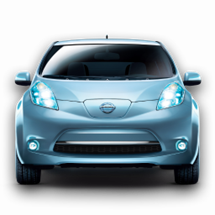 Nissan has released an application today that's going to make their two-dozen LEAF owners very happy: an official LEAF app that allows you to directly control features in the car from your Android phone. Jokes aside, the app is actually very neat and packs in some really futuristic features. If you have an active CARWINGS subscription, then you can view the battery's current charge level and even begin charging the car remotely from your phone if it's connected to a power source. 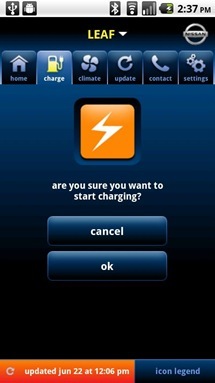 The application will also be able to tell you how long it is until the charge will be completed. 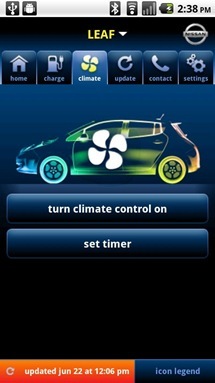 Other features made available through the app include the ability to remotely control the climate control system in the car, so you can have it all warm and toasty by the time you get in to drive. You can also see the remaining driving range. One feature I would like to see that isn't included in the application is the ability to view any charging stations near to your current location. This would be especially useful on the road, as your phone could interface with the car's satellite navigation system to provide information about charging stations throughout the country. 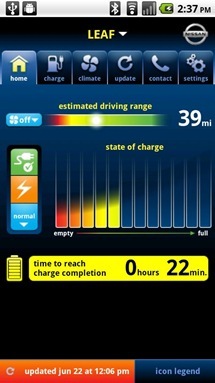 It could also alert you if there is a charge station just within your remaining driving range. Considering that this is a 1.0 release of the application, it's a great start and will hopefully make its way into Nissan's future electric offerings, too. Developer: Nissan North America, Inc.